Network of Biblical Storytellers Seminar convenor, and Texas Lutheran University scholar, Phil Ruge-Jones is in Scotland for this one performance only! Drawing closer to twelve, in the lingering half-light of northern spring and summer nights, I lay awake trying not to worry. There has been a calm about me in recent days, and I can't help thinking there must be a storm around the corner. Content with my own company, I am gently moving through the days and completing each to do list without much fuss or task avoidance. Writing, reading, marking, walking: I am doing all the things I tell myself I'll do, and that's not like me. There is always something I'll put off until tomorrow, some reason I cannot go for the walks I so enjoy. I lay awake, trying not to worry that the less efficient me will fumble through the door again. Sam Johnson, Australian actor, has been in my mind these past few weeks. Sam and his sister Connie are living their story of Connie's experience of cancer very publicly, through their campaign to raise money for cancer treatment, cure, eradication if they can. Love your Sister has captured imaginations with Sam's unicycling around Australia and his recent Swear Jars. They've written a book together, and are invited to speak in many different places. I follow their efforts through Facebook. Recently, Sam posted on their Facebook page that he had broken down in tears when speaking; it seem that Connie had been posting photos from hospital a bit more lately, too. I didn't know how to write a poem that didn't sound twee. Until I was falling asleep the other night and the words began to take shape. Written for an actor whose work I love, and his sister, inspired by their love and defiance. Personality tests identify for whatever strength, a shadow side, a limitation, a potential downfall. What about the shadows, the traits, features, elements of our lives that are seemingly out and out limitations, downfalls, weaknesses? Is there really a lining to these clouds that shimmers all glittery silver? Can you polish the dirt and reveal gemstones of beauty, however rough? This I pondered when the grand feature of my life - aloneness - seemed again to loom overwhelmingly as a negative, a weakness, a limitation, a downfall. I am single. This is isolating. I am a PhD student. An isolating experience. I am a writer. Often isolating. I am an ex-pat. Also isolating. I live with depression. Very isolating. But 'solitary' is a choice I make, a feature of the vocation to which I know myself called that I am growing to appreciate and embrace, not least because it is rare to be single by choice, and I do so love being different from the crowd. 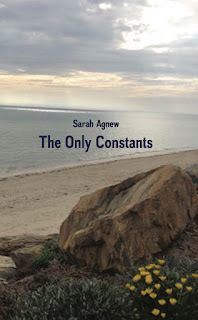 The Only Constants – my latest poetry collection – was launched at Pilgrim Uniting Church last month, on an evening when stories from the (in)humanity series were told, with beautiful piano music from Glenyce Durdin in between them. My dear friend, mentor, colleague, Rev Sandy Boyce launched my book, and spoke words that melted my heart. Thank you, Sandy. I share her words with permission, and with deep gratitude. Sarah and I have been companions on the way for about 20 years, and it is my privilege to speak to Sarah’s new book The Only Constants. 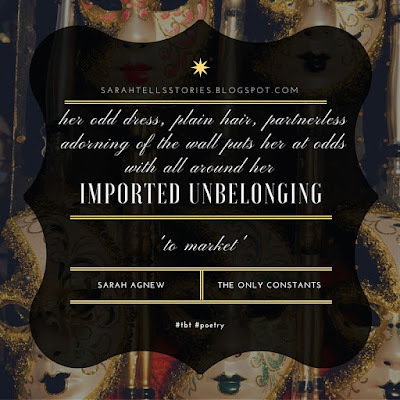 Sarah is a wordsmith, carefully crafting words to convey deep meaning. 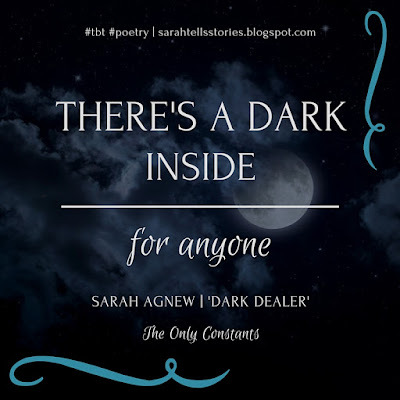 For myself, I use too many words to convey meaning - though thankfully this is a brief introduction tonight to Sarah’s latest compilation of poems and reflections. Heading into phase three of the PhD, write up and editing, the midweek musing is a reminder to myself of what it is I am doing, and why. We've been going a year with the sarah tells stories patreon site – so it was time for a bit of tweaking. I've done a new video and revised the goals – and there is a new reward for all patrons. 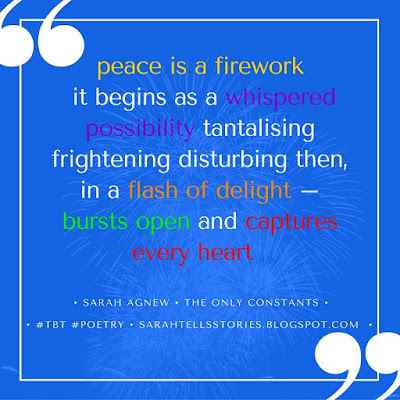 My new venture, Pray the Story, offers a prayer-poem once a week connected to one of the biblical stories for the week to come. Patrons get all the prayer-poems for a month in the middle of the preceding month, starting this weekend with the prayers for June. Sign up now to receive your rewards – sign up now and help the stories fly wild and free, taking us humans with them away from fear and into love.